The holidays are a great time to gain perspective. Whether you’re considering a new career, or find yourself missing the daily grind, we’ve got you covered with 7 office movie classics to watch over the holidays. From driven entrepreneurs to greedy corporate sharks, these films have what it takes to make you laugh, cry, find new respect for fellow employees, and remember what matters most. Bill. Murray. Need we say more? Charles Dickens’ classic tale is retold 1980’s-style, as greedy TV exec Frank Cross learns the true meaning of the season. Mele Kalikimaka! A Christmas classic by any measure. But we particularly recommend it for anyone who’s ever worked for a Mr. Shirley, or is anxiously awaiting that Christmas bonus. So pour a cup of eggnog and enjoy some memory-making with the people for whom you work so hard… your family. All Milton wants for Christmas is his stapler. The hypnotic trance of Peter Gibbons will lull you into a wintery coma of complacency. Blur the lines between right and wrong as a team of tech-savvy misfits seek office justice. We think Santa would approve. And, if your office is getting a new printer for Christmas, you’ll know what you can do with the old one. While it’s not very Christmassy, our list just isn’t complete without this classic movie. The rags-to-riches biopic of business success Chris Gardner will inspire you to find true wealth in the magic of the human spirit. If your local business struggled this year and you’re feeling overwhelmed, the story of George Bailey will remind you what success in life is really all about. J.C. Wiatt proves you can have it all. 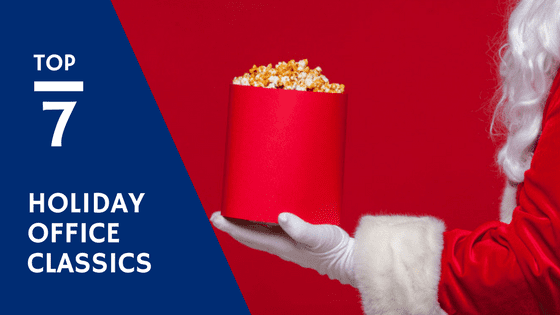 Since most of the movie takes place in Vermont – and there’s lots of snow in Vermont – it’s a perfect movie choice for a little entrepreneurial inspiration during the holiday season. Warm up some homemade apple cider and toss another log on the fire to watch Diane Keaton seize her big business opportunity. Seasons greetings from our offices to yours!